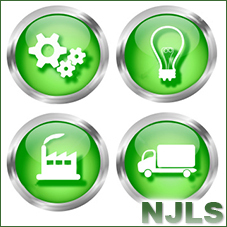 NJLS has a firm commitment to energy-efficient green initiatives. By reducing the courier vans’ carbon dioxide emissions and retrofitting the warehouses’ lighting fixtures with LED titanium tubes, NJLS is expected to generate a savings of about $52,000 in annual fuel, electricity and maintenance costs. “NJLS’ green initiatives make sense from a global responsibility standpoint but still directly impacts our clients; our lower costs become their lower costs,” said NJLS President Robert W. Pladek, Esq. NJLS contracted with Titan LED to replace its fluorescent lighting at its Union, NJ, headquarters with energy-efficient, clean-tech and made-in-the-USA 17W & 36W LED titanium tubes. (This is the same equipment entertainer Jay Leno uses in his vintage car garage!) NJLS has reduced its annual energy use by 70.6% from 44,008 kWh to 12,941 kWh. This measure alone is expected to generate a savings of about $7,500 in annual electricity and maintenance costs. Additionally, NJLS expects to reduce its CO2 emissions—carbon footprint—by 41,318 pounds. This is the equivalent of taking four cars off the road per year or planting 7.95 acres of trees.